Pushed a couple updates to the skin-modifier branch: output-face attributes and non-square skin limbs. These have both been frequently requested. Example of material and shading for skin output. The skin modifier UI now has a material selector. It shows all the material slots of the active object, and the selection will be used for all faces output by the skin modifier. Similarly, all faces will be either flat-shaded or smooth-shaded depending on the selection made in the combo box. Example of non-square skin limbs. 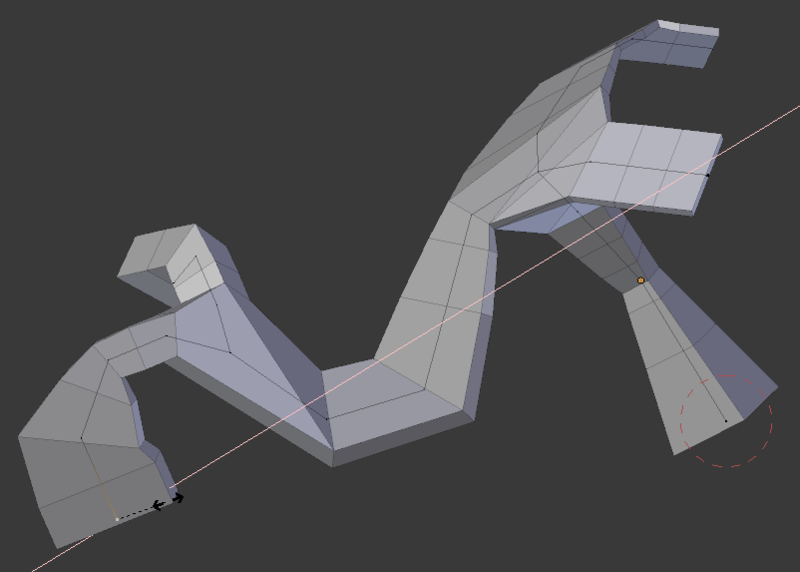 The second change, non-square limbs, means that you can now scale the X and Y axes of vertices independently. It uses the usual scaling mechanism, so pressing (for example) SKEY, XKEY will work as expected. Note that rotation is still entirely automatic, so you can’t choose the exact angle of a non-square limb, but should be OK for many cases. Code is in the usual place. Update: as suggested here, I’ve removed the material selection in favor of simply using the object’s first material slot. Great job, can’t wait to try it out, the skin mod is getting better and better! the non square feature miss me a week ago. 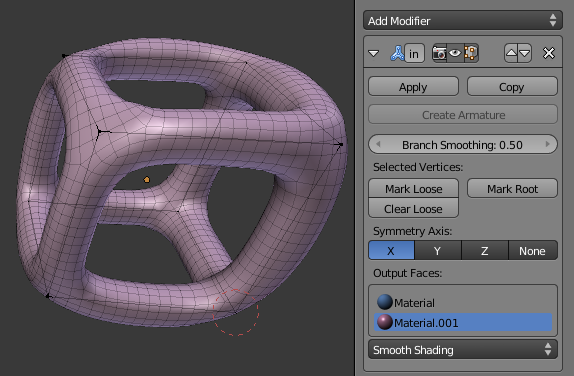 For the material I ‘don’t understand why you don’t get it from the base vertices? how i install this addon? which files do i need to download? This code exists as a separate branch of Blender rather than an addon; to use it you’ll need to either pull the code from the Github repository and build it, or wait for someone to upload it to graphicall.org. 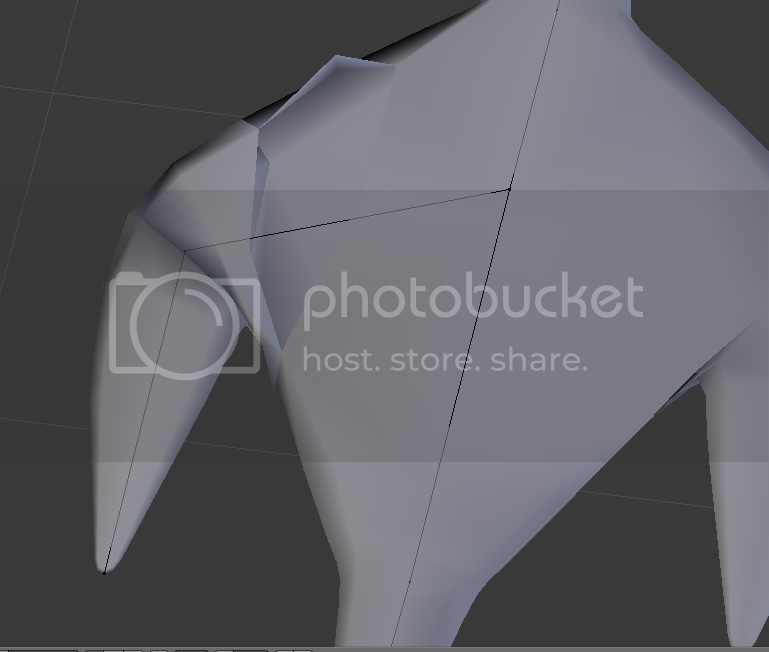 Also extruding the mesh in itself to create a hole or dent seems to work only when it feels like it and creates inverted normals, granted though the inverted normals thing is very easy to fix. It’s a bit hard to tell from just an image, but I think that the bug you are seeing with holes has been fixed since that build. Can’t really tell what’s gone wrong there, but if you post a .blend file I’ll see if I can find the problem. Thanks, found some problems there and pushed updates fixing two separate bugs.